Sarah Stockdale is here to call BS. In her talk “The Myth of the Lonely Genius,” Sarah unpacks what it really means for us to harness our collective power and how social media is the perfect place not just to share memes and peek into our high school classmates lives, but to democratize networks and create a better world together. This talk focuses on actionable ways to build evangelical digital communities and networks. We’ll be exploring key insights from Sarah’s years of building a 6000 person, international student ambassador team through social. Sarah is an entrepreneur, startup growth hacker, and innovation professional. She is the Founder and CEO of Valerie, a boutique tech growth consultancy based in Toronto ON. Sarah is a guest tech expert for The CBC, a TEDx speaker, and a (very) amateur stand up comic at Second City. She frequently speaks at universities, events, and conferences across North America. Sarah has spent 10 years working on early-stage technology startups, starting as a foundational team member of Wave, a Canadian financial technology giant. 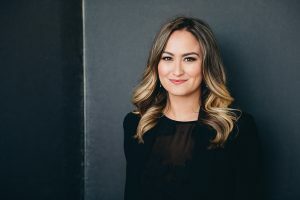 More recently she led the International Community Growth team at the San Francisco payments startup, Tilt, which was acquired by Airbnb in 2017. There, she and her team built the largest international student ambassador program to date, with 6,000 college ambassadors in 8 countries. The Influencer Marketing Bubble is about to Burst. Are you Ready?